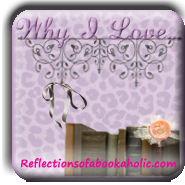 Why I Love Wednesdays is a weekly meme created and hosted by Alexis of Reflections of a Bookaholic. Each week she posts a Why I Love Topic that she answers. If you would like to participate head on over to her site for the topic and the image. Alexis is really making me think on this one and its so hard to narrow it down. I’ve read so many great scenes this year that I could og on and on. But for times and my sanity’s sake, I’ll go with two that I’m remembering. Benny, Nix, and the Lost Girl are in the Rot & Ruin planning to rescue some kids from some lunatic bounty hunters who intend on using them in their sick Z-Games. All manner of hell breaks loose and chaos ensues between the rescuers, the bounty hunters, rambling zombies, and the frightened kids. Just when you think all is lost, and there is no way any of the characters you love is getting away unscathed and unharmed, something phenomenal happens. I’d say what, but I don’t want to give it away in case you decide to read it….but I was so PSYCHED! The epicness of that scene will stay with me for a long while and it kind of makes me want to read it again! There are so many scenes full of awesomeness in this book that it’s hard to pick. But I love the one I’m going to share because it made me feel quite proud of Rob Stark, and my heart just filled up with joy for him. It’s near the end of the book and Rob has gathered the North forces to move against The Lannisters for killing his father and essentially holding his sisters hostage. He has won some important battles against the Lannisters and now speaks with the council of men he is relying on to help win this war he is involved in. The men of the North decided they will not serve Joffrey, Stannis, or Renly and declares Rob their one and true king, and dons him, The King of the North. The scene was so moving! And lucky for me they made this a tv series so I can use the accompanying video! Nice picks. You’ve got me thinking what my favorite scene is. Probably the final battle in Harry Potter. YES YES and YES! That final showdown was EVERYTHING! I tried to pick from books I’ve read this year. If I had included last year, Harry would have been all up and through this post! Yes, I remember that part in Rot and Ruin! : ) I really need to read Game of Thrones – I’ve been a sloooow reader lately. I’m trying to think of my favorite scene and my mind is racing around different books, characters, and scenes and I can’t seem to pinpoint a fave. I’ll probably be thinking about it for a good portion of the day now. Wasn’t it awesome!!!! I was so geeked when it all went down. It’s so hard to pick when you’ve read so many good books. This was a hard topic for me. I love this question! It’s not often you see that around 😉 Plus, it totally had me thinking about it as well and it’s really a tough one! It is a tough question right! There are so many great scenes to pick from. This is a fun meme. Good choices too. Thanks for the comment on my Pushing The Limits review. I just saw the book was on NetGalley if you want to get if from there for review. Also, ugh I am so behind on the Games of Thrones things. I haven’t seen the show or read the books, but I hear about it so much I feel like I can just barely get the references ! You should certainly try and watch the first two seasons! I think you’ll love them. Yup! There was so much to pick from so I had to go with the two sticking out in my mind. The King of the North!! I loved that scene in the movie, and I bet it’s even better in the book! It was amazing in both the book and the television! They did a great job translating it to screen. Oooh great picks! So sorry that I didn’t get a post up so you could link up. My mind was an absolute mess and I didn’t think to check and make sure the post had posted. No worries! I knew you were dealing with your bar exam! Me too! They were so awesome!